Tried to share this a while back, but can't seem to be able to upload pics from my iPad? 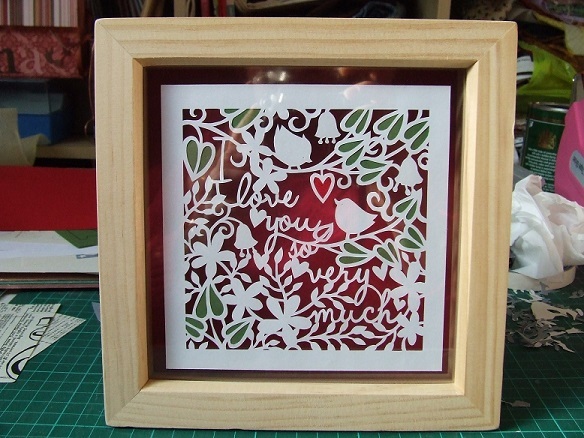 Something that I can do, when not too tired, is papercutting (because it's easy to stop and start without losing the thread of what you're doing) ; I made this and put it in a box frame for P for Valentine's Day; the template is by Paper Panda. That's pretty, steady hand needed. It's nice to see something a bit different. That's absolutely beautiful, Tina! Your birthday card to me was a paper cut, too, and it's lovely. Not sure I'd have the patience, so am very envious! aww thats super and a very effective technique too, never seen that before. That's stunning, how do you cut with a template? I imagined that the pics were drawn on and then cut out. Lovely work Tina, not sure I'd have such a steady hand. Do you use a knife or scissors for cutting? I use a knife, and a glass cutting mat (purchased on a shopping trip with our old forum member Claire many years ago in Normanton). It's a printable template in mirror image, so you cut from the back. Most important lesson I have learned is that photocopier paper is rubbish, 120gsm paper is lovely to cut, and also, rather than changing knife blades once in a blue moon, it tends to be after about 1/2 hour of cutting! That's a good few blades worth then, super work. Gosh can't believe thats done by hand, I have tried just to cut out a circle and its a mess, well done you.